I saw an ad the other day, from a company claiming to be Laneway Housing experts…hogwash! The new Toronto laneway suites by-law passed in June 2018, after 20 odd years of political debate about it. There are now multiple applications in various phases of review, but none built yet (as of March 2019). If you know Toronto, you know dozens of laneway houses already exist. Each one was a hard fought journey that likely lasted years, with plenty of supplementary fees for development, legal and planning levies (we’re talking 80K+) to clear the way for the current iteration of the laneway suite by-law. I’m grateful to finally see this change and look forward to how it’s going to shape the downtown residential core for the better. This is all thanks to the efforts of forward thinking city planners, Evergreen and Lanescape who paved the way for the rest of us. 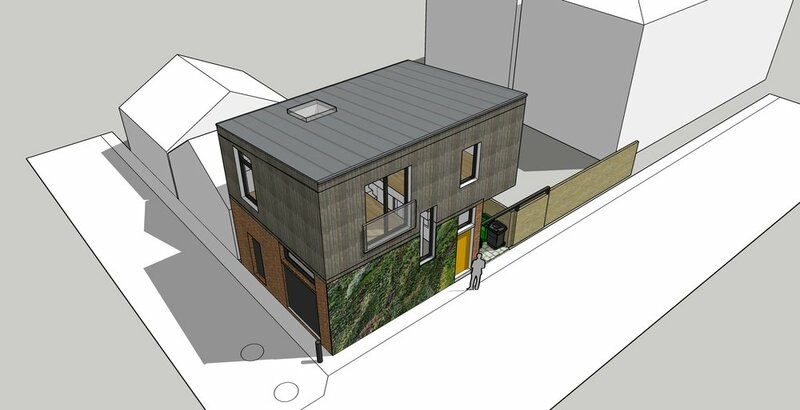 The laneway suite design and approval process is not as easy as turning any ol’ garage into a rental suite. It’s not blanket permission. There are several key design and site criteria that must be met. The nitty-gritty is not intuitive to the average homeowner, heck, it’s not even intuitive to design professionals either. Here is my perspective on some basic and not-so-basic stuff you should know. 1. You need a lane for it to qualify as a laneway suite. If you don’t have a laneway, but have a generous driveway and a big property…nope, that’s a house behind a house and doesn’t qualify. That may come in a year or so more, so don’t give up yet. 2. Laneway suites are only permitted in Toronto and East York right now. But the rest of TO is hopefully coming soon! You can use the city’s website to see a map and look up where your address falls. 3. Laneway suites are to be rental units only, and can’t be severed from the property. Services such as water, plumbing power, gas etc. must tie in to the existing house. If say, you have a basement unit in your home already, you can’t do a third unit (i.e. a laneway suite) without paying those nasty development, park and education levy charges form the old by-law. Better to get rid of the apartment beforehand. And there will be a hold on severing the property after it’s built too, for at least 15 years. 4. Clearance requirements from the street can be tricky. There has to be a 1 metre continuous clearance from the street, down the side of the main house, all the way to the laneway suite. BUT it must be measured to the property line, and NOT to the neighboring building as was previously interpreted. It’s for paramedic and fire access, not zoning, so there aren’t many design solutions around it. A distance of 0.8m won’t do! That may mean moving gas meters and existing bay windows to make the path clear to a height of 2.1m. Luckily the property line here is located at the right distance from the main house. Here, there seems to be the right clearance between the two buildings, but if that neighbour’s house was ever rebuilt, they might be able to re-build tight to the property line so the required clearance would be lost. That’s why the city has interpreted it as measured to the property line and not just between the existing buildings. But wait! 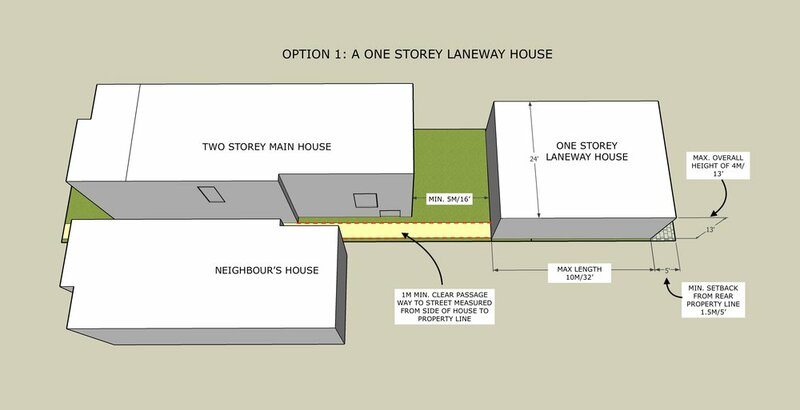 If the laneway house is less than 45m from another street, and then no more than another 45m to a fire hydrant (so a total of 90m), you don’t seem to need the 1m side access clearance! Another loophole is a legal right-of-way shared between adjoining properties. If there is a right-of-way, the 1m clearance minimum passageway can be measured from wall to wall, since the neighbouring house can not be rebuilt into that right-of-way. It also might be possible to sprinkler the laneway suite building to get around this. Diagram showing that homes closest to the laneway/street corner are most likely to qualify for the 1m side clearance exemption, if there is a fire hydrant within 45m of the laneway. 5. A laneway suite can’t be bigger than the existing house, but surprisingly, it can be super small. You can convert a one car garage to one if you add a second storey, and you can just do a one storey one if you have a double garage already. The height is capped at two storeys, with a max height of 6m and a max length of 10m. Oh, and it needs to be at least 5m from the house for a one storey only laneway suite, and at least 7.5m for a two storey suite. Sketch showing the maximum size for a one storey laneway suite on a sample property. Sketch showing the maximum size for a two storey laneway suite on the same property, with required angular plane. Sketch showing a smaller size two storey laneway suite on the same site, setback further from the main house to get beyond the angular plane requirement. 6. What can I do if my property doesn’t *quite* meet all the zoning criteria? The requirements for the 1m emergency services clearance is a deal breaker, and would not qualify for a variance as they are fire and building code related, not zoning related. So get those loopholes established first before you go ahead down the design road. Some zoning requirements such as setbacks and angular plane penetration might qualify for a little non-compliance with by-law variances. Variances go through Committee of Adjustment (C of A), just like regular variances for houses. The C of A is not super fun, as it adds six months and a few more thousand dollars to the process, spins your neighbours into a tizzy and of course, there is no guarantee whatsoever that your variances will be approved. If you want to learn more about what C of A is like, check out our informational comic book. 7. Parking. You are allowed to remove the existing parking spaces the garage had provided (for the main house), but you must in turn provide space for two bicycles somewhere on the property for the new tenants. You could also keep your parking and build a smaller one storey unit above the cars so that works too. Some will grumble about the loss of parking, but please remember that an on-street parking permit for one car costs about $215 per year (more for a second car), whereas the value to of the new space can be somewhere around $600 per square foot! Priorities, people. 8. The city may provide a 50K build incentive for a select number of qualifying laneway suites. It will be available through the Affordable Laneway Suites Pilot Program, and it seems to suggest about 20 houses. The catch is that you must charge rent below market rate for 15 years and rent to tenants below an income limit for that time period. Some say that it’s not worth it long term, but I haven’t done the math on it. Here are some averages. 9. So, how much will it cost to build? Well, that really depends on what you’ve got already, the access to the site, and what size you are going for. It wouldn’t be an exaggeration to say it can’t be done for less than $250K, and likely $500k plus. Sigh. Oh and don’t forget your taxes will go up! Building permits trigger new tax assessments. Long story short, there is no laneway house expert, we are all learning by doing. It’s going to take some time and many projects that have gone through the process to call oneself an expert. If you have dreams of a laneway house, get in touch with us for a home design consultation (scheduling form below). We’d be happy to help you assess what is possible with you property.